There’s no better vehicle than an Arkonik Defender for an adventurous family. It’s the perfect companion to live a life without limits. The Klebleev’s based in Oregon USA, are one such family. With a lust for travel and the great outdoors, they commissioned Arkonik to build a stunning, yet highly capable Defender 110 station wagon. 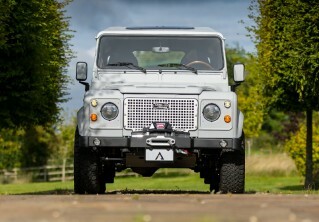 The result was OUTRIDER; a rugged, overland-equipped, Aintree Green 200TDi with the resilience to match its appearance. Since taking delivery of OUTRIDER just over a year ago, the family has wasted no time at all in utilizing their Defender to embrace the wilderness. With the addition of a Tepui roof-top tent, there really are no limitations to their ongoing adventures. The coastal U.S. state of Oregon lies in the Pacific Northwest and is known for its diverse landscape of forests, mountains, and beaches. The city of Portland itself is famed for its quirky, avant-garde culture making it the ideal place for this Arkonik Defender to reside. The iconic spirit of the Defender will ensure OUTRIDER continues to create memories that will last a lifetime. Check out OUTRIDER D110 Edition here or contact us for more information.